Egg farmers show their commitment to safe, high-quality eggs by implementing mandatory and voluntary farm food safety programs. A diverse mix of regulations, guidelines and industry best practices – while complex – should fortify consumer confidence in the safety of eggs eaten in restaurants or purchased in grocery stores. Most commercial U.S. egg farms voluntarily participate in the “5-Star” Total Quality Assurance Food Safety Program. 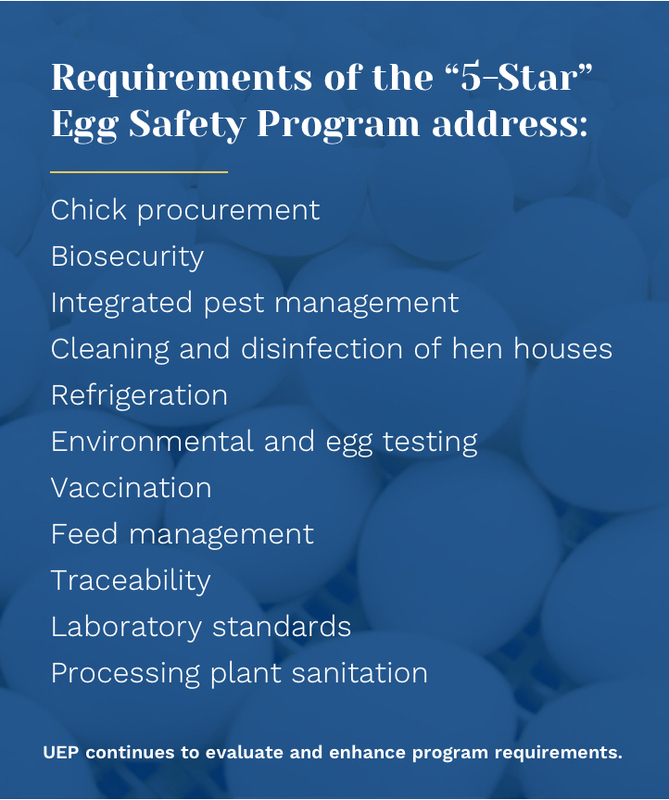 “5-Star” was established in 1994 by the United Egg Producers (UEP) to reduce Salmonella Enteritidis (SE) in the laying hen population and was redesigned in 2009 to go above and beyond the Food and Drug Administration’s Egg Safety Rule. Egg farmers worked with federal and state officials, veterinarians and poultry scientists to develop the program and provide a proactive way to monitor and control SE on the farm. “5-Star” is a comprehensive, dependable food safety program from all stages on the farm and in processing, which provides consumer reassurance that eggs are safe. HAACP addresses food safety with analysis and control of biological, chemical and physical hazards from production through distribution and consumption of the final food product. HAACP is designed for all segments of the food industry and Good Management Practices (GMPs) provide the essential foundation for successful HAACP plans. Egg production has implemented the seven principles of HAACP, which have been applied in other successful food safety programs, such as the Safe Quality Food (SQF) program. Safe Quality Food is recognized by the Global Food Safety Initiative (GFSI) and links certification of primary production to food manufacturing, distribution and agent/broker management. Food Marketing Institute (FMI) administers SQF, which allows retailers to continually share consumer concerns with SQF-certified suppliers. SQF is the only program to integrate a quality component with food safety. The SQF Code was updated in July 2014 and is equipped for an ever-evolving market. In addition to national safety programs, many states have voluntary Egg Quality Assurance Programs (EQAPs). 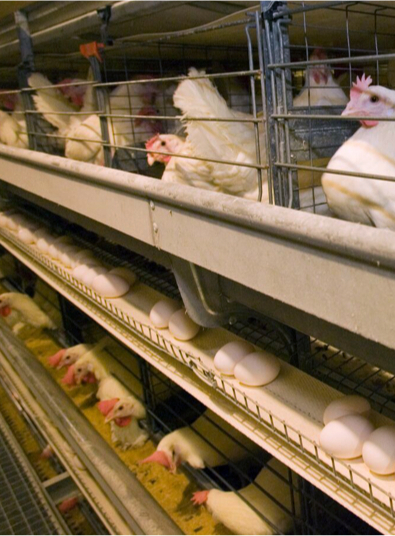 EQAPs are HAACP-based programs designed around egg production, management and monitoring practices implemented to decrease the risk of SE illness. The Center for Disease Control (CDC) found EQAPs play a major role in the reduction of SE illness in the U.S. Farmers take many steps to ensure egg safety and quality. Learn more about food safety programs here.